A Fun-Filled Musical for the Whole Family! “Once upon a time, there was a little ogre named Shrek....” And thus begins the tale of an unlikely hero who finds himself on a life-changing journey alongside a wisecracking Donkey and a feisty princess. 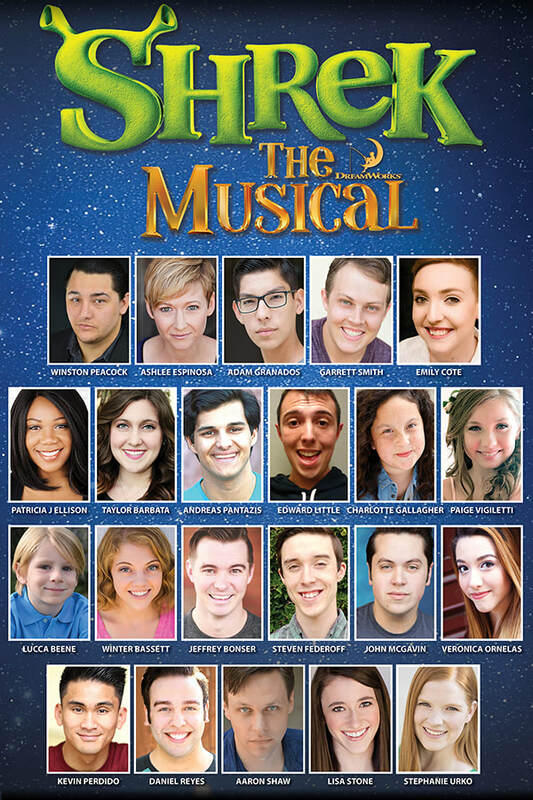 Based on the Oscar-winning DreamWorks Animation film, SHREK THE MUSICAL is a Tony Award-winning fairy tale adventure, featuring all new songs from Jeanine Tesori (Thoroughly Modern Millie; Caroline, or Change) and a sidesplitting book by David Lindsay-Abaire. Shrek brings all the beloved characters you know from the film to life on stage and proves there’s more to the story than meets the ears. Irreverently fun, but appropriate for the whole family, Shrek proves that beauty is truly in the eye of the ogre. This musical comedy is perfect for the fall Halloween Season and is appropriate for all ages. Dinner selections are accompanied by a garden salad, freshly baked bread, choice of entree, vegetable, potato or rice, coffee, tea, iced tea, dessert and, of course, a fabulous show! Mushroom Filet Mignon - A 6oz filet topped with sautéed mushrooms. Served with fingerling potatoes and steamed vegetables. Teriyaki Seared Salmon - An 8oz Salmon filet seared and served with house made teriyaki sauce. Accompanied by rice pilaf and steamed vegetables. Rosemary Chicken - A boneless chicken infused with rosemary and caramelized onions. Served with fingerling potatoes and steamed vegetables. Vegetable Lasagna - A delicious option for our vegetarian guests (potato and side vegetable are not included with this entree). Children's dinner selections are accompanied by a garden salad, freshly baked bread, choice of entree, dessert and, of course, a fabulous show! Jazzy Junior Chicken - Chicken strips with golden French fries. Creamy Mac n' Cheese - Macaroni pasta mixed with a delicious, creamy, homemade cheese sauce. Packages include garden salad, freshly baked bread, choice of entree, vegetable, potato or rice, coffee, tea, iced tea, AND dessert...tax & gratuity are also included in this package!! VIP SEATING: All of the items in the ALL-INCLUSIVE package PLUS guaranteed seating at one of our 4 center tables and one complimentary glass of champagne (or soft drink)! All adult entrees are accompanied by either potato (or rice) and vegetables, except Vegetarian Pasta entree. Prices listed include a $21 show fee. Above prices do not include the $1 CC Processing Fee (charged per ticket when ordering). ​Only All-Inclusive & VIP Packages include tax & gratuity. Tables may be set to maximum capacity. You may be seated with other guests at your assigned table. Make a new friend! Complete dinner, show and hotel package for two. The Enchanted Evening Package includes a complete three-course dinner for two, accompanied by a glass of champagne, with live entertainment at Center Stage. 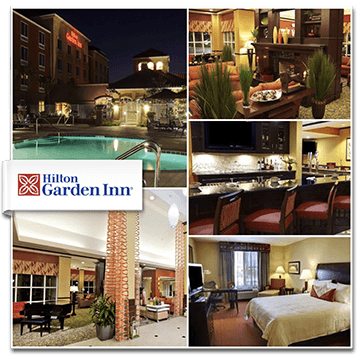 After the show, enjoy a relaxing evening at the nearby Hilton Garden Inn Fontana with breakfast included the next morning. All taxes and gratuities for both the theater and hotel are included in this price. CALL 909-429-SHOW (7469) ext 0 to reserve your special evening! Bar, appetizer and dessert items are available for purchase. VIP seating and a la carte dinner options NOT available with show-only tickets. Fontana residents save even more - please call for details! Guests who purchase a "show-only" ticket should arrive by 8:15pm if they wish to order appetizers, desserts or cocktails before the show. Guests who purchase a "show-only" ticket should arrive by 7:45pm if they wish to order appetizers, desserts or cocktails before the show. Guests who purchase a "show-only" ticket should arrive by 2:45pm if they wish to order appetizers, desserts or cocktails before the show. ​Show run time for SHREK is approximately 2 hrs and 30 minutes, including intermission.